I think Overlord was originally going to be the fourth Cloverfield anthology movie, but after the straight to Netflix film was released, they removed any references to Cloverfield, which is a good thing because this movie did not need it. 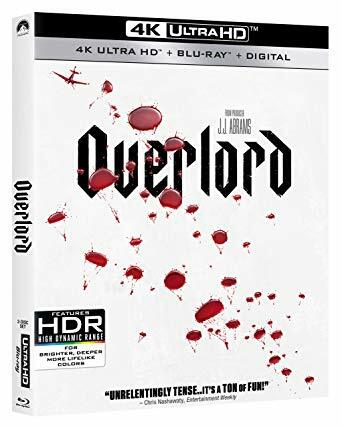 Basically Overlord is sort of like From Dusk Till Dawn in that film the first half is a crime thriller and the second half was a vampire schlock flick. Only here Overlord never goes over the top and plays it straight throughout. The effects are top of the line as the first half is a WW2 D-Day invasion film in that paratroopers land in France with a mission to take out a German radio tower in a church so the allies can land on the beach with air support. After about 45 minutes to an hour it turns into a horror film where the Nazis had found a mysterious substance deep beneath the church and have been using it to create super soldiers that don't die easily and can reanimate. The film has a definitive ending that explains why this story is not in the history books and that is that. Overlord is a solid flick worth seeing. This combination 4K Ultra HD Blu-ray Disc + Blu-ray Disc + Digital Copy Set features virtually more language options for both the 4K BD and the BD versions than I can list because some are listed in the language they are spoken in and I simply cannot tell what they are so if I left out some options, I am sorry. Both versions feature English Dolby ATMOS Soundtracks as well as an English DSV Track for the visually impaired. I believe a German Dolby ATMOS Soundtrack as well as Spanish, French, Italian, Japanese, Polish and Brazilian Portuguese Dolby Digital 5.1 Surround Soundtracks. English Subtitles and English Subtitles for the Deaf and Hearing Impaired are also encoded onto both discs along with Malaysian, Cantonese, Dutch, Danish, Spanish, Latin American Spanish, French, Hindi, Italian, Japanese, Korean, and Suomi Language Subtitles are encoded as options. The 4K widescreen has an impressive color palette with deep blacks and lush greens despite the at times monochromatic nature of the film given the setting and so forth. When bursts of red occur whether it is blood, gun fire, flames and military machines blowing up they take up an even more impressive look that just pops on screen. Unconverted the 1080p edition might have certain viewers preferring it over the 4K HDR version if only for what it lacks in deep color saturation it make up for in brightness that for some might be preferential over the more shadow evocative 4K Disc presentation. Within the black 4K Ultra HD single size Two Disc BD Case is an insert with a limited time only numeric code allowing for the redemption of a digital copy of the film for iTunes or select other providers. The Blu-ray Disc also features a series of featurettes that can be viewed individually or as one reel (51:28) and covers in impressive detail the development of the story, the visual effects, which were mostly practical and casting as well as the experience the actors had working with each other. While Mr. Abrams says the casting choices were not for historical accuracy so much as to find the best person for the part, which I find to be admirable, Wyatt Russell, who looks and sounds so much like his father it is uncanny, stated the film takes place in an alternate universe, which made me wonder again about whether or not this was going to be a part of the Cloverfield Anthology of films even though I have read that when J.J. Abrams was asked at SDCC 2018 regarding the connection, he said it was not. Personally I do not think it matters because the film stands well by itself and yet I hope they never try and make a sequel because having watched this film three times now, I have noticed so much subtle touches and clues that create a sense of wonder in that as I have stated, less is more, I don’t want to see someone take this up in twenty or more or less years and make an unnecessary sequel. Overlord is a gem. Please enjoy it, but leave it alone. I love the soundtrack by Jed Kurzel. It sounds like what I imagine Goblin and Carmine Coppola working together might sound like if they had ever collaborated. While both films are very, very different in their approach and style, I want to mention Richard Raaphorst’s Frankenstein’s Army as a film that might make for a good splatter filled double feature in part because I think Frankenstein’s Army deserves to be viewed beyond the cult audience it has attracted as an independently produced WW2 period horror film, but the films share similar themes as well as I like seeing a film that tells a story of Soviet soldiers entering Germany toward the end of the Second World War because there are not a lot of English language films that cover this and they were allies instrumental in the defeat of the NAZIs in WW2 so they deserve their due just as the American and British Soldiers do because it could not have been down without any of them and make no mistake, the AXIS powers were in my opinion some of the most vile and malevolent threats to humanity the world has ever faced. 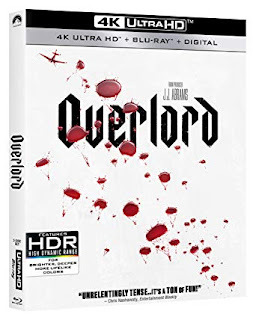 Anyway, Frankenstein’s Army is available on Blu-ray and streaming and has been for five years now, but the Overlord: 4K + Blu-ray + Digital will debut along with a Blu-ray and DVD edition sold separately and on Tuesday, February 19, 2019 at retailers on and offline courtesy of Paramount Home Media Distribution.